When I was 13, my mother told me that I was a slob. She said it as if it was a given; something that she and I would have to live with for the rest of our lives, but we not only didn’t have to be happy about that, we should add it to a long list of my detriments that should make me feel sad for the rest of my days. 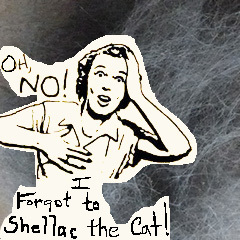 Labels stick; even when, 20 years later, I thoroughly cleaned the house and bought flowers to prior to her visit, I noticed–too late–that somehow cat fur had accumulated behind the toilet in the bathroom, and there was a small pile of vacuum debris beside the trash can, where I’d emptied the vacuum. These I saw, and knew they proved my mother right. But on day 2, when I was changing the flower display, taking out dying ones and adding fresh, my mother warned me: be careful not to try to make everything perfect; remember my friend Betty who had electroshock therapy for depression? She eventually committed suicide because she couldn’t be perfect. So my mother’s message turned out to be, “you’re a slob–live with it, and enjoy life!” And I am and I do–mostly. When I clean, I discover I have a strange habit of thinking of something else when I’m in the middle of sweeping, then returning to the room I was in much later and discovering: a) a pile of dirt waiting for the dust pan, or b) a room, neatly swept on one side and completely untouched on the other. Having a pet makes this sort of thing easier to spot, though the fur does tend to drift toward the clean side as well. But the point of this is acceptance. No matter how determined I am to clean my home thoroughly, I seem to always leave behind a spot (or 10) that I somehow missed, and I will always mentally kick myself for missing it, then have to remind myself that it happens. Always. Sadly, I’ve also become quite good at noticing what other people miss, but only when they are boring me, which isn’t often. Still I’d rather my house be (mostly) clean than not. I think this is why I’ve always hated working with numbers. They are not so forgiving. I’m working on Budgets today, and it amazing me how a column of number can add up to one thing in one direction and a completely different thing in another direction. For now, though, I think I’ll just go and see if I can paint the dog in shellac to keep him from shedding.